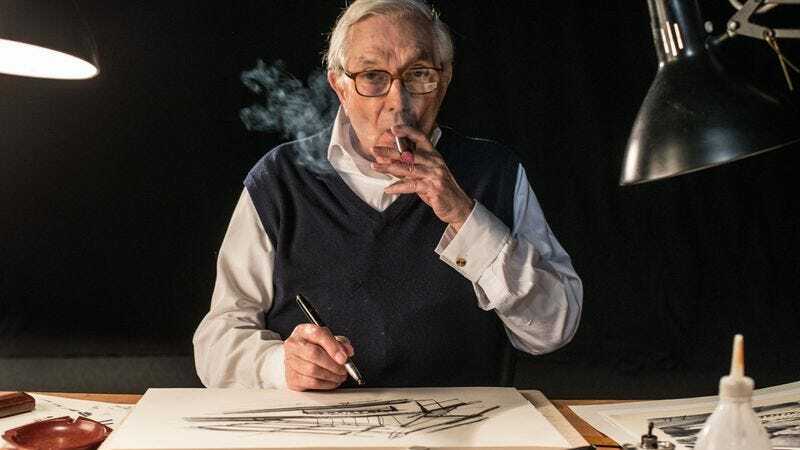 Ken Adam, the German-born production designer whose futuristic and geometrically bold sets captured the imaginations of generations of moviegoers, has died. Bringing expressionism into the Space Age, Adam designed the likes of the Pentagon War Room, Auric Goldfinger’s laser table, and the lairs of Dr. No and Ernst Stavro Blofeld, as well as the gadgets of James Bond’s iconic Aston Martin, and won Oscars for his work on Barry Lyndon and The Madness Of King George. Adam’s death was confirmed to the BBC by his biographer. He was 95. Adam was born Klaus Hugo Adam in Berlin, into a wealthy Jewish family that relocated to London in 1934 after their high-end fashion business was forced into bankruptcy by the Nazis. He attended University College London and the Bartlett School Of Architecture with the intention of becoming an architect. Still a German citizen at the outbreak of World War II, Adam initially joined the Pioneer Corps, a British Army engineering unit composed of Axis nationals. There, he received his first design assignment: bomb shelters. Adam began working the film industry after the war, initially as a draughtsman, working his way up to assistant art director and then art director on films like Around The World In Eighty Days (on which he also served as the uncredited production designer) and Ben-Hur. His first official production design credit came on Jacques Tourneur’s horror classic Night Of The Demon in 1957. In 1962, Adam was hired to design Dr. No, the first film in what would become the James Bond franchise—a series that would become the center of his life’s work, and lead him to design some of the most outrageous (and largest) film sets ever built. However, Adam turned down the opportunity to design Dr. No’s first sequel, From Russia With Love, opting instead for the movie that would produce his other iconic work: Stanley Kubrick’s satire Dr. Strangelove, Or: How I Learned To Stop Worrying And Love The Bomb. Adam’s design for the massive Pentagon War Room, with its severely angled walls and ominous ring of lights, remains one of most famous images of the Cold War. Kubrick wanted Adam to return for 2001: A Space Odyssey, but the designer—whose sets combined daring modernist spaces with a sense of the fantastic—passed after learning of all the NASA research the director wanted to integrate into the film. He would offer his own wildly imagined take on space in the James Bond film Moonraker. He would work with Kubrick again on the period piece Barry Lyndon and, in secret, on the Bond film The Spy Who Loved Me—in many ways, the culmination of Adam’s work on the franchise. Adam brought on Kubrick’s stepdaughter, Katharina, to design the metal teeth worn by henchman Jaws, and later contacted the director himself after it was discovered that cinematographer Claude Renoir—then in the early stages of the vision loss that would end his career—couldn’t see the end of the film’s massive supertanker submarine pen. So Kubrick traveled to the studio in secret to personally light the set, a tunnel of gleaming metal surfaces. Though most famous for his sets, Adam was also one of the definitive designers of fantastic cars, creating 007’s ejector-seat Aston Martin, the flying automobiles from Chitty Chitty Bang Bang, and the submersible Lotus Esprit featured in The Spy Who Loved Me. In addition to his work with Kubrick and the Bond franchise, he also designed Bond counter-programmer The Ipcress File, for which he won a BAFTA, and Addams Family Values, which earned him his fourth Oscar nomination. Adam’s final screen credit came in 2001, with István Szabó’s Taking Sides. Though he became a British citizen and legally changed his first name to Kenneth, Adam maintained strong ties with Germany, where his personal archive is maintained at the Deutsche Kinemathek in Berlin. He was knighted in 2003 “for services to film production design and to U.K.-German relations.” Though trained as a practical architect, Adam created designs that pushed into the impossible, making him into a kind of Piranesi of the Cold War: oversized props, ceilings curved or sloped at unusual angles, gigantic spaces whose emptiness suggested flood tunnels for global power. Through the resources of film, he was able to make the purely imaginary seem real.